Yes those are my dirty make up brushes I was too lazy to wash them for the photograph, does that make me a bad blogger? Lol. Don’t troll me for not washing them, I do know the importance of cleaning my brushes and my favourite way to do this is using Dr Bronner's Peppermint Liquid Castile Soap. As you may or may not know my interest in makeup does not go much beyond foundation, blushers and tinted lip balms but I have built up a little brush collection. All my brushes are cruelty free as I refuse to buy those made with animal hair. 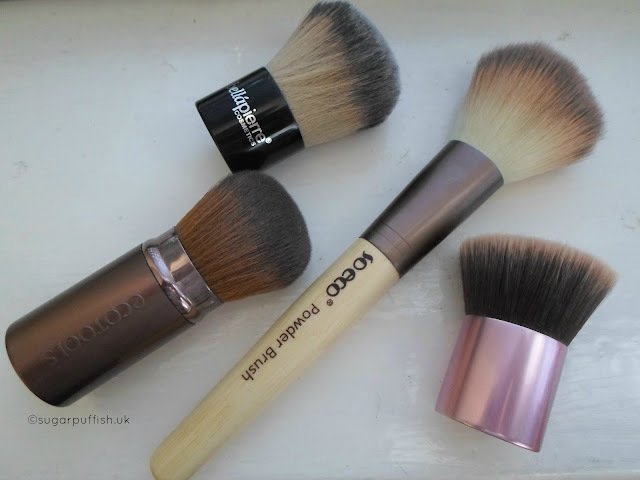 So Eco Powder Brush – judging from my haul videos I bought this brush last year. It’s a brand sold at Tesco and was not too expensive (£8.50). I no longer have the packaging but I spoke about it in a haul video. The brush and packaging are eco-friendly. The bristles are super soft and I prefer this for applying blusher. Neve Cosmetics Bunnybuki Kabuki Brush – This is one of my oldest brushes (pink handle) having bought it back in 2013. The logo has long since rubbed off but it did once have cute bunny picture. Looks like this particular brush is discountinued from the site where I purchased it but it’s a Baby Flatbuki. It’s the one I reach for most as I think it gives me a fuller and flawless coverage when applying my Everyday Minerals Semi Matte Foundation. Bellapierre Kabuki Brush* - this brush came into my possession in a Naturisimo discovery box. It is super soft but the most expensive in my collection. Unlike the Neve brush this one has a rounded top and I use it mostly for when I want a light coverage of foundation. Eco Tools Retractable Kabuki Brush – I bought this one with the excuse of my recent holiday in Porto. Whilst I am more than happy to travel with my other brushes they can end up in bad shape because they are not protected in my cosmetic bag. I think this Eco Tools brush is similar to Bellapierre in terms of softness, shape and performance. The convenience of having a lid means you can throw into your bag and not worry about damaging the bristles. I hope you found this post of interest? As you can see I am a fan of Kabukis. Whilst I'm here chatting about brushes, let me mention that Bathing Beauty have recently launched a set of 10 Vegan, Cruelty Free Make up Brushes which I know a lot of bloggers have been lusting over. I have a Lily Lolo kabuki brush and it is so dense it gives me excellent coverage. I have a 100 other kabuki brushes but none are quite on the same level!